We are happy to introduce the first in an ongoing series of conversations and interviews with the Areaware designers. We asked our Spring 2016 designers to pick someone they know to conduct an interview with them about their practice. The following is a brief conversation between Bryce Wilner, designer of the Gradient Puzzle, and artist Laurel Schwulst. You once sent me a photo of a flower looking into a mirror. Where did you take this? I took this photo a couple of years ago at the Garfield Park Conservatory in Chicago. I saw this beautiful flower—I think it’s an orchid—that was “facing” away from the walkway. 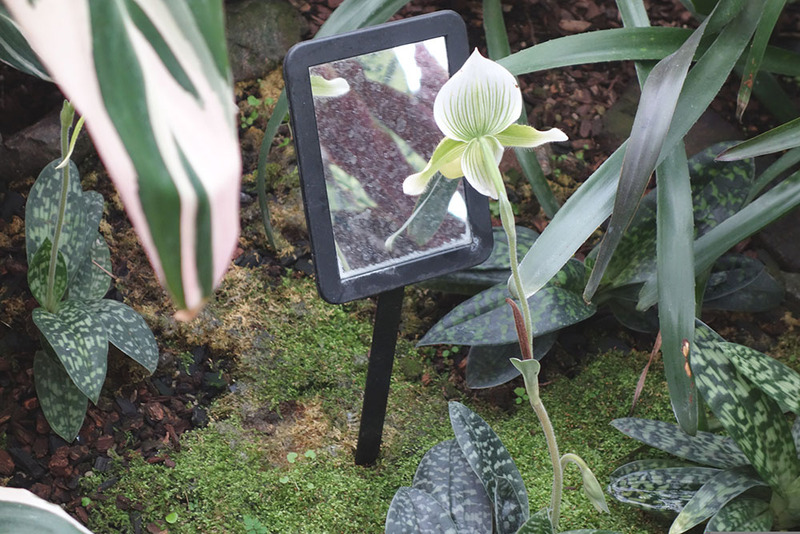 The workers at the conservatory obviously wanted me to see the “face” of the flower so they placed a small mirror in front of it. The flower couldn't look at itself, but I have to imagine that it eventually began to regard the mirror as a light source, and maybe even the sun. The flower was interested in the mirror not because it was curious about itself, but because it wanted nutrients. I like how you took the photo so that we still don't know what the "face" of the flower is, or even if it has a face. I recall you tweeting something about websites being mirrors. Do you remember this? Oh yes, it was about how often a person wants a website that acts as a mirror, telling them, every time they visit... “you are beautiful”. These websites people make for themselves are static and unchanging, painting an aspirational picture of what this person wants to be. I am more fascinated by personal websites that appear a little less perfect to an outside viewer. Often these websites have use for the person who made it, so the function doubles. Without intending to, functionality always paints a picture. Maybe you could say these websites are more like toolboxes than mirrors. Your website contains tools: an open source font library. That’s true. The library is a tool because anyone, including me, can use it. On my website I cite the Open Source Font License and write that users can download my fonts and fork them into modified versions of themselves for free. So far, I only know a few organizations that have worked with them: MTV, students at the School of the Art Institute of Chicago, Areaware, and the Yale Interactive Design website. All of my fonts are pretty imperfect. Do you think perfection is something people should pay for? If I were to ask somebody to pay for them, I would probably receive complaints. I don’t imagine many of my fonts ever existing in a commercial setting. For example, I conducted a workshop at the Museum of Contemporary Art Chicago with the designer Mollie Edgar wherein we asked seven students to produce a font in two hours using metrics and cut-paper shapes we provided for them. The typeface they designed—and that I made into a font called TCA —is remarkable for its variation in legibility. It’s hard for me to believe that anyone would ever pay for TCA, but it’s valuable to me because it’s an unexpected, formal execution of a precise concept. I know that you like to drink wines that are intentionally “funky” and that taste a little like they’ve gone bad. Would you pay for a wine that was made, like your TCA font, by students? Or one that is more concept-driven than “tasty”? I might not. I would like to know about the students’ means of production. Maybe I would buy a whole bottle, but I’m not sure I would bring it over to a friend’s for dinner. [Laughs] I think you should try bringing it over for dinner sometime and purposely not acknowledge the fact that it’s strange. If your friends complain, they can drink something else. But I think setting the stage for these things to exist in the world is important. It’s like giving a bottle of wine the benefit of the doubt so it can really sing. Yes, in these scenarios it is good to consume without too much background. These ideas remind me that sometimes we have to consciously empty ourselves of background noise in our own heads. Recently I took your advice and lay on my floor before I started to work on a project. Of course, it worked and I thought of some strategies to begin designing. Later, I wondered why the floor is a good place to do such a thing. I assume it's because we look at our spaces in unusual ways and start to be emptied of the thoughts that were distracting us. Do you have a theory about this? I remember a quote from the psychoanalyst Adam Phillips: “As adults boredom returns us to the scene of inquiry, to the poverty of our curiosity, and the simple question, What does one want to do with one’s time?” As an adult human being, I find it very difficult to be bored in everyday life, so that’s where the floor comes in. (And taking the subway, trains, and airplanes. But sometimes you’re just stuck at home.) Maybe laying on the floor is like taking a voyage around your own room. Phillips’s words relate to a quotation I like from the composer Laurie Spiegel : “A lot of pretty wonderful music and art [comes] out of staring at the blank canvas. Sometimes it’s pure silence that lets you listen to what happens inside your own head.” Perhaps it is fair to say that boredom or emptiness is also a mirror—a reflective surface that shows us our own thoughts. Laurel Schwulst is a human being. She has taught Interactive Design at Yale University and California College of the Arts. Bryce Wilner is a graphic designer and publisher based in Chicago. In 2015, he designed a Gradient Puzzle for Areaware.